There was a pretty heated discussion of Islam on comedian Bill Maher’s HBO show over the weekend. 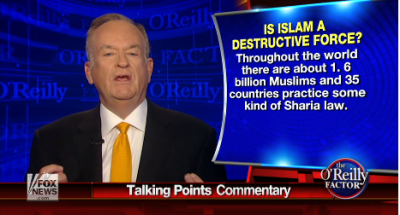 And on Monday night (10/6/14), Fox host Bill O’Reilly decided to weigh in. There are about 1.6 billion Muslims and 35 countries practice some kind of sharia law. That means they are governed by people who abide by principles of Islam that are controversial to say the least. In some places you can even be stoned to death for committing a sin. A study published by the Pew Research Center last year asked Muslims if they favor sharia law. In Afghanistan, 99 percent do; Pakistan 84 percent; Iraq 91 percent; Egypt 74 percent; Jordan 71 percent…. So you can see that millions of Muslims think their religion should dictate what happens in society. offers moral and legal guidance for nearly all aspects of life–from marriage and divorce, to inheritance and contracts, to criminal punishments. Sharia, in its broadest definition, refers to the ethical principles set down in Islam’s holy book (the Quran) and examples of actions by the Prophet Muhammad (sunna). Mr. Maher is correct on the overall effect Islam is having on the world right now. The truth is many Muslim nations have not confronted Islamic terrorism, have not attacked violence in the name of Allah, and have not even condemned the jihad. There are exceptions to the rule, but they are few. Muslims around the world strongly reject violence in the name of Islam. Asked specifically about suicide bombing, clear majorities in most countries say such acts are rarely or never justified as a means of defending Islam from its enemies. You may remember that hours after America was attacked by Al-Qaeda on 9/11, thousands of Muslims, regular folks, celebrated in the streets. They were happy that more than 3,000 innocent people, including Muslims, were murdered. Again, these people are a minority, but they were not called out in any official way by Muslim nations around the world. To illustrate this, O’Reilly plays a clip (one that is very familiar to Fox viewers) of what appears to be a dozen or people in East Jerusalem. But it is far easier to document the ways Muslims around the world showed solidarity with the United States, with Muslim leaders and scholars speaking out and clearly condemning the atrocities. As Talking Points stated last week, most Muslims are peaceful people. Even if they do believe in sharia law, that’s a flaw in their thinking, it doesn’t mean they are violent maniacs. For every Muslim in the world that wants democracy and wants human rights, there is one who doesn’t. And the one who doesn’t, doesn’t have any rules. And it will blow the hell out of the one that does. At least his Islamophobia is evolving.